We travel all over Northern Michigan gathering fun forest finds to use in our unique potpourri blends. From our little island cabin in the Straights of Mackinac, we wild harvest evergreens, pine cones, nuts, berries, moss and more. On our North West trips from Traverse City on up through the vineyards and peninsulas, we stop at the road side stands for peaches, plums, cherries and a few more berries. Then out to the fields of mid-Michigan for wildflowers, thistles, scrub sages and sweetgrass and of course ...some more berries. You can bet, I can never be found without a pocket full of twigs, pods, nuts and oh of course... a few more tiny little bramble berries. ...And ​this is how it all got started. ​makes our potpourri so special. and he is full of curiosity! 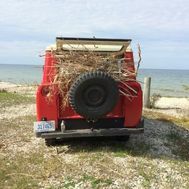 ​Randy's 1963 Island ride, with a character all it's own . A perfect harvest hauler, Scout gets into the thick of things and comes out of even the most rugged terrains with a full load of potpourri pickings. ​Scout is our perfect Northern Wildcrafter.